Other readily visible clues that this message is phony baloney include failure to address the recipient by name and to specify the account number in the first paragraph. It's not easy, however, to remember how each of your vendors addresses you in their regular emails. Most include your name somewhere, but not always. Further inspecting the innards of the message, I see that the crooks tried to forge the headers to look like the message originated from an AT&T mail server. At the final stage of the header trail, however, the reverse IP address lookup performed by my mail server failed to resolve to a domain name. 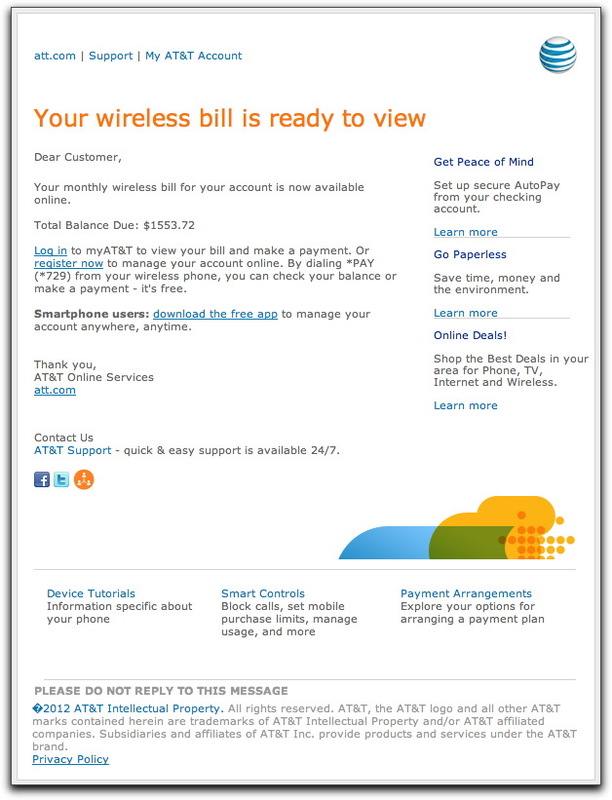 Legitimate AT&T emails to customers also employ a domain key signature. You have to keep telling yourself (and your friends and neighbors) that when you receive an email message (even from someone you know) that contains anything outrageous, route your adrenalin to your rat-sniffing faculties, not your clicking finger. Clicking a link or opening an attachment in such emails may be the last thing you do with your computer before it — and all your valuable data and login credentials — fall into the hands of Bad Guys.